Why doesn't the earth cool as much from La Niña as it heats from El Niño? I'll add another question. 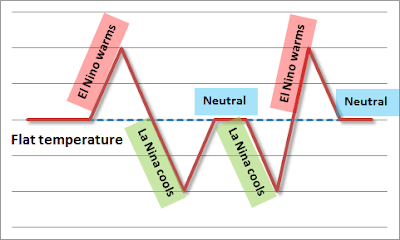 After La Niña and El Niño, when ENSO returns to neutral, why does the earth still get hotter? You can read about the three phases of ENSO at the Bureau of Meteorology. It is blatantly obvious to anyone ... that there would be little to no long-term warming of the lower troposphere temperature anomalies for mid-to-high latitudes of the Northern Hemisphere if lower troposphere temperature anomalies had cooled proportionally during the La Niña events of 1988/89 and 1998-01. Let's look at this chart from this WMO report showing La Niña and El Niño years. 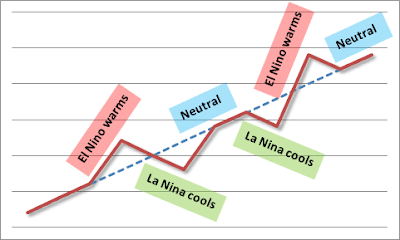 Yes, both La Niña and El Niño years are getting hotter as are the ENSO neutral years. Sometimes the simplest answer is the right answer. I wonder if Bob will ever manage to connect the pieces and have a 'light bulb' moment. Yes, a very nice illustration you've got here. It's amazing that Bob Tisdale thinks that his question illustrates a problem with AGW when, in fact, it indicates an issue with his own theory. It's almost like a clever double bluff. Saw the update on today's post that links here and had to comment again...Bob simply doesn't understand conservation of energy. It's that simple. I figure Bob came up with the ENSO notion because he thought it might be going too far if he rejected the temperature record as well as the greenhouse effect. He might also be feeling sorry for poor maligned carbon dioxide. Remember too, he's in direct competition at WUWT with Willis Eschenbach, who's been trying to resurrect Lindzen's debunked Iris theory (while claiming it for himself). Bob needs to offer an alternative or he couldn't justify his "books". Bob's dug a hole for himself over the years and after self-publishing his books and trying to make a buck from them, he can't afford to admit he is wrong, even if he had the brains to work it out. Anthony Watts doesn't care one way or another. Anything to keep up his daily quota and blog hits. He gets all his articles for free.